There are a number of resources I return to again and again online, in order to either find useful texts for pupils to read, or to deepen my contextual knowledge of texts. Here are five sites I think are really helpful. Below is a screenshot that shows you how it works. I’ve chosen the line “‘Tis an unweeded garden / That grows to seed.” from Hamlet’s first soliloquy (Act 1, Scene 2). You can see that there are 53 references to this line in JSTOR. It lists them on the right of the screen, and by hovering over each one, you can see the page of the article on which it is referenced. 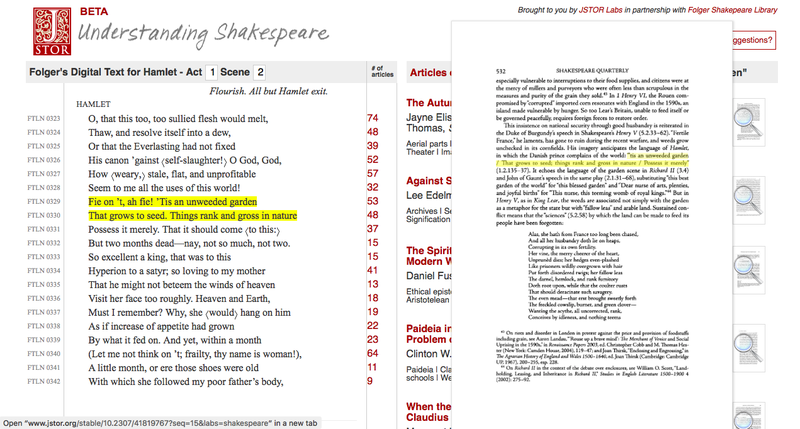 In the referenced page on the example above, you can see how the line can be seen as part of a tradition of similar references to husbandry as a metaphor for kingliness and national security across a number of Shakespeare’s plays. Illuminating, right? I love these. Here you can browse some really interesting articles on Shakespeare and the Renaissance, Romantics and Victorians, and Twentieth Century literature. All of the articles are linked to items in the British Library’s collection (mainly original manuscripts), with embedded slideshows throughout the articles exploring these items. There’s some really useful contextual stuff here. This is an American website containing “a free collection of fiction and nonfiction for 5th-12th grade classrooms”. It is a wonderful digital resource. You can search texts based on the grade they are aimed at (just add 1 to get the UK equivalent age: 6th grade is the same as Year 7 in the UK), or by the text’s Lexile range. Or – and this is where it is really useful – you can search it based on theme, genre (looking for speeches or short stories? ), or by a short list of books that the texts link to (for example, searching for texts linked to Animal Farm returns some nonfiction articles on Stalin and the Russian Revolution, among other things). You can also search for texts based on linguistic and rhetorical devices, so if you are looking for examples of hyperbole or dramatic irony, the search will return texts that contain these. What’s more, each text comes with a series of questions to help comprehension. And you can download each text as a PDF (which includes these questions). With some articles, some iWonder pages and some BBC archive videos, this is a really useful source of contextual information for literature texts. With pages on the Tudors, the Victorians and some key moments of the Jacobean period (to name but a few useful touchstones for English teachers), there are some great resources here. In a similar style to the BBC History site, English Heritage’s simple timelines and overviews of the key periods in English history are a valuable resource. Not only is this organised by period, you can also explore it by themes such as Power & Politics, Religion, Daily Life, and Arts & Invention. Have a look and see what you think.